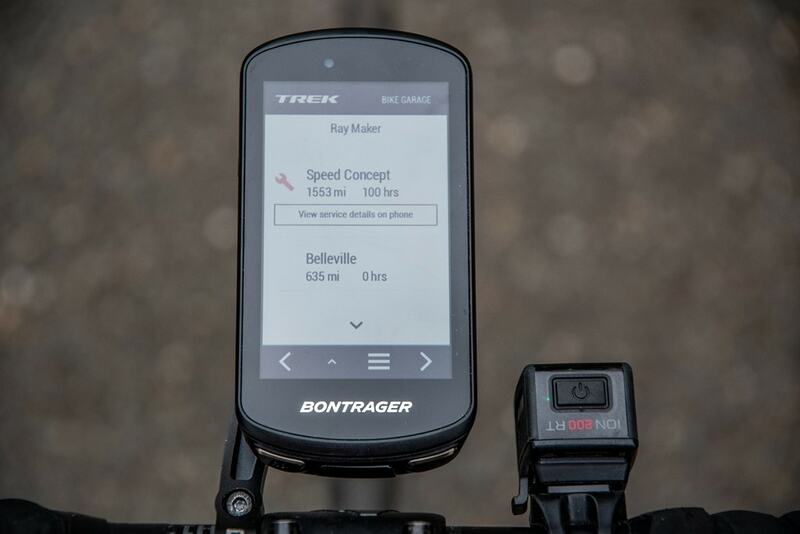 Today Bontrager announced the Edge 1030. Wait, Bontrager? Don’t you mean Garmin? Nope, I mean that company owned by Trek but not named Trek – that’s Bontrager. See, they’ve partnered with Garmin to offer a slightly unique Edge 1030 model that’s only available through Trek channels (meaning their dealers, their online store and sometimes some other random places). 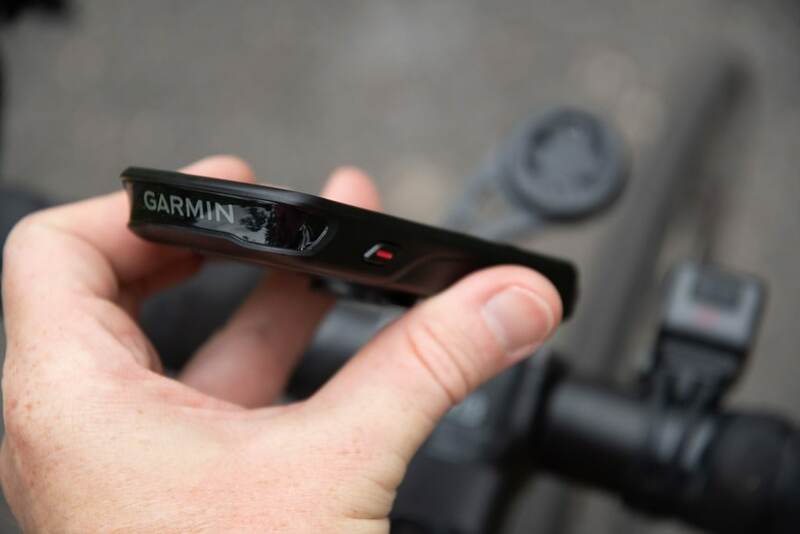 This model is fundamentally a stock Garmin Edge 1030 from a hardware standpoint, but does come with some unique software tweaks. 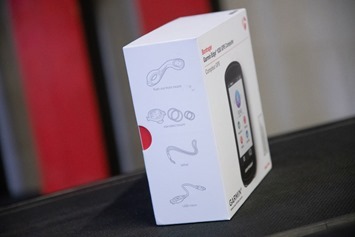 Oh, and it’s got a super nice black looking case that reminds me how ugly Garmin’s stock Edge 1030 white design is. Basically, it outclasses the original Garmin Edge 1030 in the looks department. I’ve been toying with a loaner unit since earlier this summer, so let’s dig into what’s so special about it. Note that technically the unit is called the ‘Bontrager Garmin Edge 1030’, but I’m just gonna shorten that to ‘Bontrager Edge 1030’, because that’s what normal people do. Bontrager stressed numerous times that this isn’t a special Edge 1030 that has unique hardware or any massive special sauce. 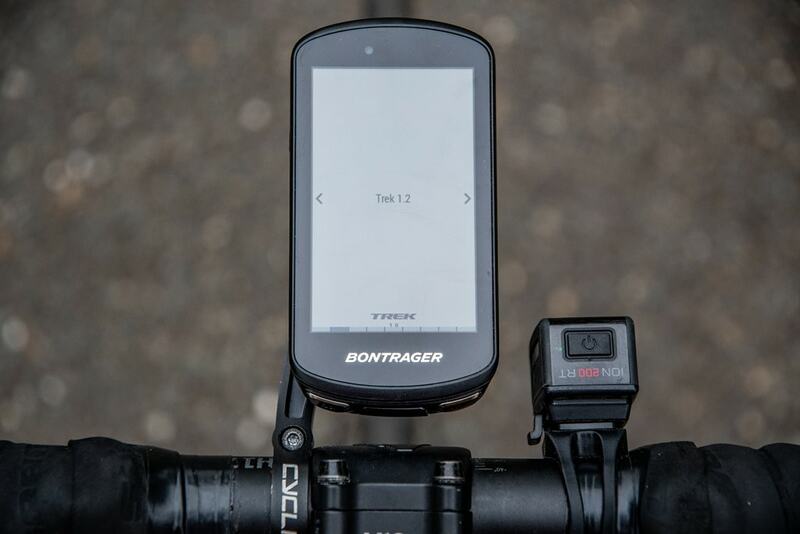 In fact, from a purely software standpoint you could replicate this exact setup on your own Edge 1030 [Except that as of this moment, Bontrager hasn’t made the CIQ apps available to all devices in the Connect IQ store for some reason, only their own Bontrager Edge 1030 shows as ‘compatible’]. And I suppose, if you got out a black Sharpie and spray paint you could even address the color scheme too. It does come in a special box though – so that’s unique too. C) Trek Bike Garage Widget: This is accessible from widget menu and is essentially the same as the bike chooser field, however it also triggers Garmin Connect Mobile to open a link to the Trek website when service reminders are needed (more on that in a second too). Now it’s two of the three of those Connect IQ apps that actually get to the meat of why Trek/Bontrager wanted their own Edge variant. See, one of the things to understand about bike manufacturers is that they all struggle with what they see as a one-time, one-way relationship. When you walk into your local bike shop and buy a bike, there’s a very high likelihood that the manufacturer of that bike will never know who you are. They won’t have your name, your contact info, or anything else. They can’t tell you about recalls or service alerts proactively, because they simply don’t know you exist. 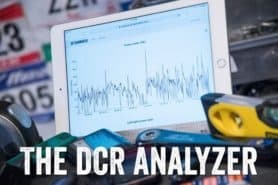 When I talk to power meter companies that are working with the big bike manufactures to have power meters built into their bikes, one of the biggest draws there isn’t actually power. 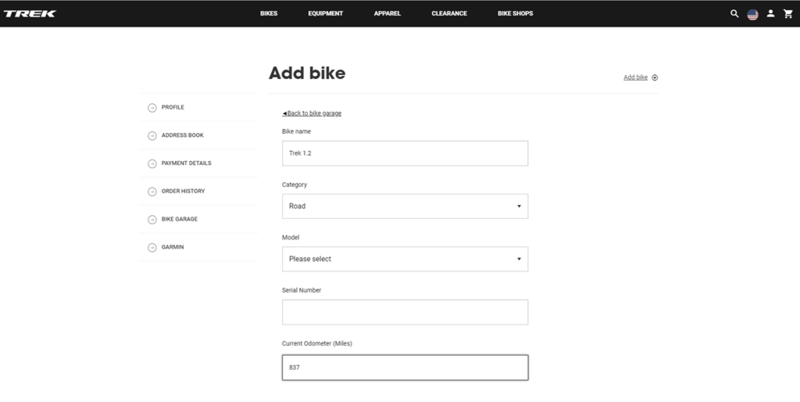 It’s requiring an app to register the bike as a whole, so the manufacturer knows something – anything, about the bike owner. Of course, we weren’t born yesterday. We know that a key reason they want that (arguably the main reason) is to be able to send you promotional information. To try and get you hooked into being a brand-loyal customer of theirs for the rest of your life. When they have access to your inbox, it makes it far easier for them to do so. After all, if a company e-mails you every other week for 3-4 years, you’re likely to eventually buy something from them (or at a minimum be aware of their offerings). Whereas if you get zero e-mails from them, it’s likely you don’t care much about what they have to say (and their opportunity is lost). That said, Trek does appear to be trying to do some customer-focused items within this. So, let’s talk about that. Once you’ve got your Trek Edge 1030 unboxed and ready to roll, you’ll pair it up to your smartphone. 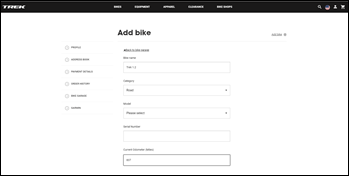 As part of that, since you have the two Trek Bike Garage/Chooser apps on there, it’ll pop-up a little dialog to take you over to Trek’s site and create an account on their site within their ‘Bike Garage’. This authentication is somewhat similar to what past Connect IQ apps use to authorize you, but seems slightly different from a user interface standpoint. Not bad, just a tiny bit different. The point of this though is to link your Garmin Connect Account (technically not your Edge precisely) to Trek. It’s here on Trek’s site where you can create virtual bikes that replicate your physical bikes. No, this isn’t an avatar type thing. 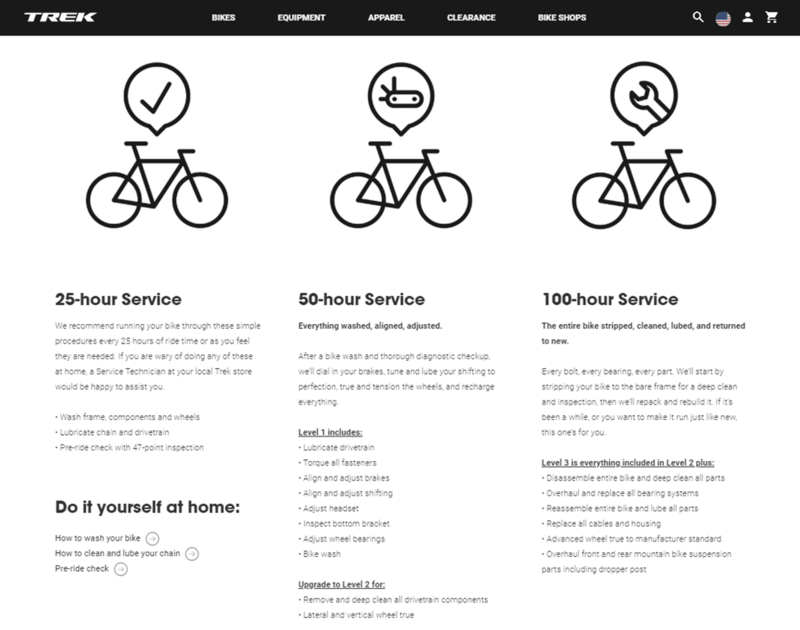 Rather, it’s just simply a way to track your bike maintenance. In my case, I created a handful of bikes. Collectively between The Girl and I, in our stable we have 9 bikes (seriously, how do we have 9 bikes?). Note: That doesn’t count any of the kids’ Fred Flintstone style push bikes. Somewhat surprisingly to me, 3 of those 9 bikes are actually Trek. The Girl has a Speed Concept triathlon bike, I have an around-town Trek Belleville bike, and then I have a bit of a test mule Trek 1.2 bike that I rarely use these days. Plus of course a variety of other bikes from Canyon, Issac, Giant, and Cervelo. I went onto the site and created a couple of them in the garage. You can choose from the most recent models of Trek bikes, but not all older bikes. For example, my Belleville wasn’t on there. Trek says they’re working to add bike types, but for launch went for just the current generation units. In addition, you can always just choose the equivalent of ‘Other’. You can add in a serial number (but it’s not required), as well as a baseline odometer reading. Finally, as part of this you’ll choose your local Trek shop. In my case, there’s one just down the street, so that’s easy enough. They have a bit of a checklist for all this as you go through it. Note that at any time you can revoke access from either the Trek or Garmin platform (in the event you have a falling out with Trek). Meanwhile, back on the Bontrager Edge 1030, it’ll have linked all this together magically behind the scenes. So if you swipe down from the widget menu you’ll see the Trek Bike Garage Widget. This shows you which bike is currently selected to ride. It’s based on this that will increment the odometer on the website. Why might you want to do this you ask? Well, this all gets down to incrementing that odometer reading. The reason they want you to do that is so that you can be aware of when you should go in for maintenance on the bike, specifically, preventative maintenance. The system will automatically e-mail you at different intervals depending on the recommended maintenance based on hours of riding. For example, at the 25-hour level it’ll send you a reminder to consider washing your bike. Meanwhile, at the 50hr and 100hr levels they’re going to recommend a bit more. You can see an example of the two e-mails below. The one to the right is the 25hr one, which includes a link to ‘Learn how’ to do some base maintenance. You can see below that it’s a pretty straightforward site full of recommendations. Good stuff. If you click on the ‘Service Package’ in the other e-mail, you’ll see what they recommend specifically. Of course, like everything, there’s dual motives here. Certainly they want you happy on their bike. And it’s known to any regular cyclist that keeping a well-maintained bike is likely to keep you on that path to happiness. If you’re unhappy and talking trash about the bike, that’s not good for them (especially if it’s something trivial like derailleur/shifting alignment, which to a less experienced person might as well mean a new bike). But of course, the ulterior motive here is getting you into a Trek shop. Their dealers make money not just on service (though not often the first one or two service check-ups)– but especially on you buying stuff in their shop. Heck, most times I walk into a bike shop to buy X, I end up buying X, Y, and Z. Trek knows this, and they want to find a way to keep their dealers happy and selling Trek bikes. I bet you pretty much do that exact list anyway. 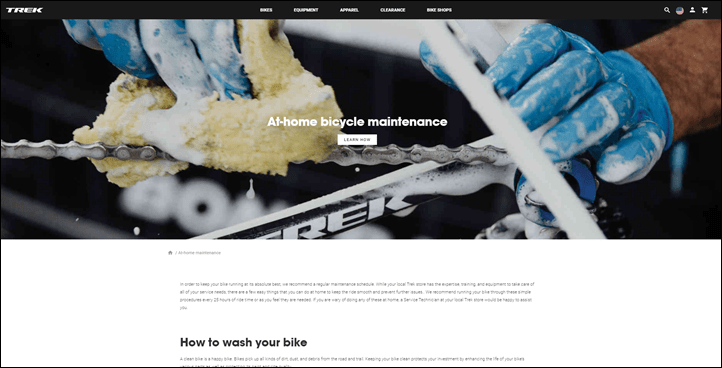 Meaning, if you’re experienced with minimal bike maintenance look at the 50hr list above. Aside from inspecting the bottom bracket and adjusting the wheel bearings, that’s pretty much the common list of things I’m always checking. So in some ways, it’s probably good for us more frequent riders to sometimes get that reminder of things to clean-up. As for the 100hr bike maintenance checklist? Hmm…Looks like I’m a little bit behind on all my bikes. Gotta start somewhere I suppose. It sounds like both Garmin and Trek/Bontrager view this entire thing as a bit of an experiment. From Garmin’s standpoint, it’s a low-cost, low-risk venture. They make a very minor tweak in a well-oiled manufacturing line to spit out a different colored cover and different box. They slap on half a dozen extra files to the Edge 1030 and call it done. Meanwhile, from Trek’s standpoint, they can see if this does increase engagement with the users that buy it. Does it result in more conversion to bike shops for them? And for the users, does it increase their happiness level of their bike experience? Obviously having a sleek black Edge 1030 will do that inherently over the white one, so I’m talking beyond just the color scheme. Is it resulting a more well-maintained bike? Of course – if this goes well I’d expect Trek/Garmin to expand it beyond the Edge 1030. 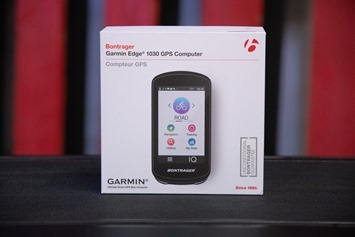 While the Edge 1030 is Garmin’s best cycling computer, it’s also the most expensive, thus, its reach is less than something like an Edge 520/520 Plus since it’s three times as expensive. Also, I think there’s some missed opportunity here for creating a Bontrager light bundle with the Bontrager Edge 1030. 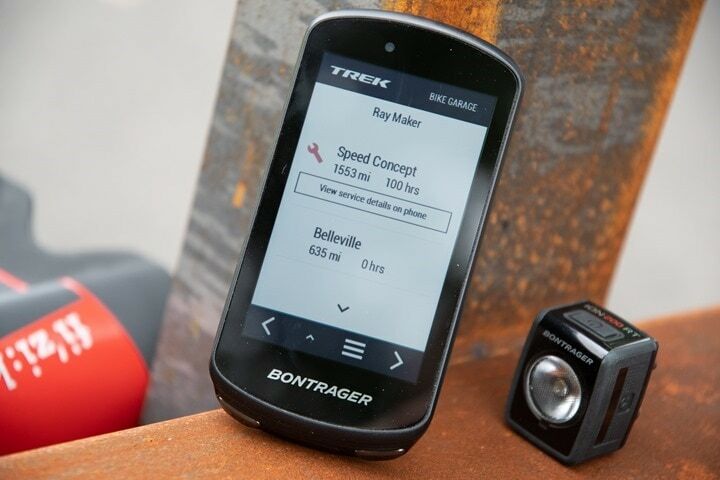 After all – that’s Bontrager’s premier tech offering and they even bundle the app with the Edge 1030. 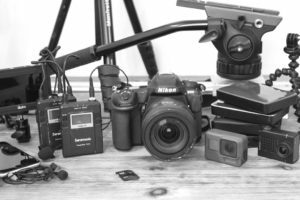 Why can’t I buy an Edge 1030/Light bundle and save a few bucks? Still, I’m interested to see how this plays out. I suspect Garmin’s going to be receiving a bunch of other calls and e-mails today from other bike frame manufacturers on how they can do the same. And while I don’t think creating 18 branded variants is the right answer, I think Garmin could do more from a backend standpoint around this that would cater to what these companies really want. For example – when setting up my bike profile on the Edge itself, why can’t I select the exact frame I have and start tracking there? And then have Garmin track that and from there enable me to allow the same level of integration with Trek, Canyon, and so-on. Bike companies would clamor for this – and once Garmin had an onboarding process for bike companies, they could self-manage their own inventory. Anyway, food for thought. In the meantime, the Bontrager Edge 1030 is available/shipping today (and already in stores in fact) and…available in black. Price is the same as the Garmin variant at $599. 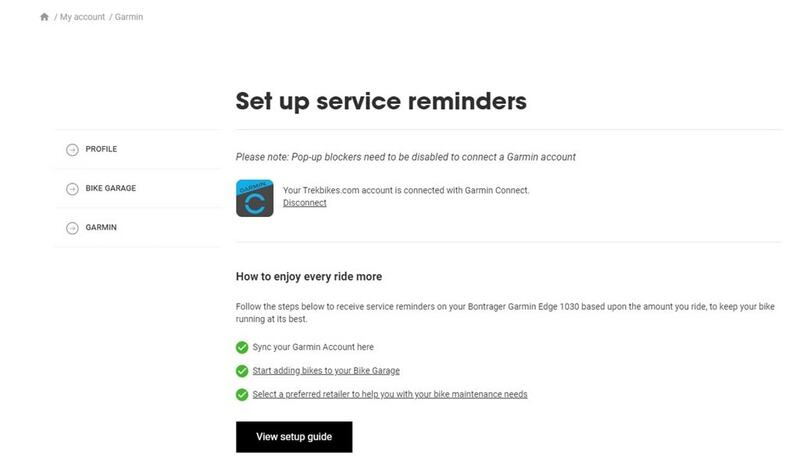 I’d be interested in the bike garage linked to my Garmin account anyway for the reminders, but I don’t see a way to link up online or via phone app without connectIQ app. Are you aware of a way to login to bike garage and sync a bike up to your Garmin account without the new 1030? In theory Trek could make that app compatible with other Garmin devices. Not sure if they plan to, but it’d be nice (it’s trivial and just a checkbox for them to do so). You can go to the Trek site and create an account and have it create your garage, but there’s no way to my knowledge to then tell it which bike you used on a ride without the app. The lack of mentioning that you should check if the chain should be replaced seems a bit strange. chains need to be changed anywhere from 1000km for hellish conditions with terrible lube to 8000km+ for dry-waxed chains in decent road riding conditions, making this too variable for them to say it must be replaced at a specific interval. It’s also highly dependant on chain checkers and in short much better to just be done by (a nerd or) a shop at each actual service and an actual service means $$$ for them! Some well thought out apps and functionality that will be helpful to some riders, so its not a waste of effort. 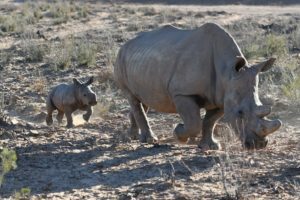 Kudos to Trek to leading this effort. It will be interesting to see if the gear tracking logic that lists total distance for each bike in Garmin Connect is eventually leveraged for some similar capabilities. My plan to get an Edge 1030 using customer loyalty points at my neighborhood electronics retailer is somewhat in jeopardy. The black finish does seem more appealing. Going the Plasti-Dip route just wouldn’t be the same. 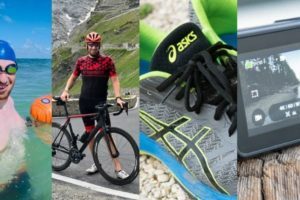 But, will udates on Garmin’s new third party brands partners depending on the third and probably been fragmented and delayed, or even fast given up like on Android? It’ll really just depend on how firmware updates go out. 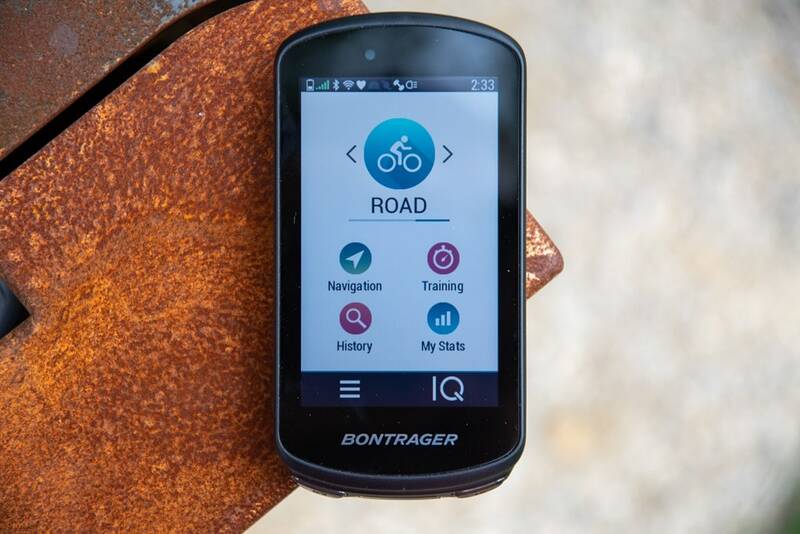 If, they go out just like existing Edge 1030 units, such that it doesn’t matter if you have an Edge 1030 or a Bontrager variant, it’s all the same firmware file – then, life will be grand. If however, they require a separate firmware update, akin to the Asian variants of Garmin products. Then that’s sucky. But my guess it’s it’s more the first. Looking at things, I don’t see any reason this requires a separate firmware. I’d think everything is likely within a single update file. Looks like different product pages but in line with the same FW #. Slightly different file sizes though. Sure would be nice if this bike chooser business was compatible with Strava. I love the idea of growing integration between the various players and am keen to see where this all leads! One of my favourite things about my new 520+ too! Can Bontrager/Trek start selling a long and low Blendr mount then? I’m stick of using the high mount with my 1030. @Eugene, the K-Edge XL mount fits the Edge 1030 (including the XL Combo with a GoPro Mount underneath) but you give up the ability to run the custom Garmin battery pack for the 1030 in the bargain. From my experience with the Trek Blendr “Garmin Low Mount (529585)”, the Edge 1030 has too much mass to stay steady over rough roads. So, once your Garmin account is linked to Trek, how much data will they be ingesting on you? Are they only getting bike identity and mileage? Or are they getting gps tracks from all activities, step counts, sleep time, weight, stairs, and all other details? If so, it seems like there should be more granular privacy/sharing options as more companies want to hook into our fitness data, otherwise this will turn into a Facebook/Cambridge Analytica scandal…. @Nate, I’d be very surprised if this wasn’t all GDPR compliant. The more interesting question would be whether your Garmin Connect and/or Strava activities are marked “private” by default? If not, you’d probably want to start there. Yeah, I was actually pondering that late last night a bit randomly (after I published). Wondering what precisely gets sent over. I’ll find out. “In fact, from a purely software standpoint you could replicate this exact setup on your own Edge 1030.” By this do you mean simply that the hardware is the same or that the added software is available and can be installed on a generic Edge 1030? 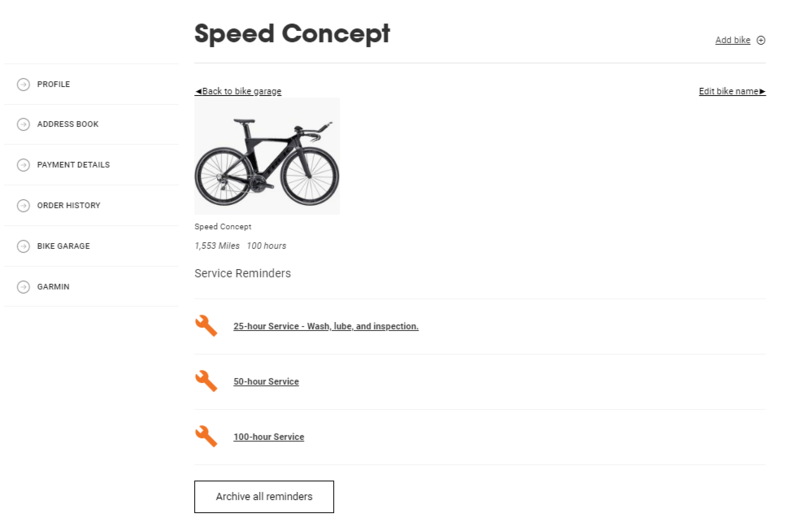 If the later, I don’t see anywhere in Connect IQ store where the Trek Bike Chooser Data Field and Trek Bike Garage Widget are available for the generic, non-Bontrager unit. Thank you. Hopefully you’ll need it back change it back soon. Trek Bike Garage reminded me that I’m still waiting for the garage door opening widget. My garage door doesn’t handle ANT+ or BLE, though. I would pay good money to be able to map a Di2 button to some sort of garage door opener. You also need a Chamberlain MyQ garage door controller. Yes, the best part of Strava’s gear tracking feature is that you can record the mileage on individual components. Very useful for regular replacement of worn components. Bike profiles has it’s meaning and reason. Seems like Strava or Garmin Connect could have implemented smart bike tracking long ago. I hate having to remember to log in to Strava to change which bike I rode, since I already picked Road or Mountain as an Activity when I started. Getting maintenance reminders from Strava would be another nice Summit feature. 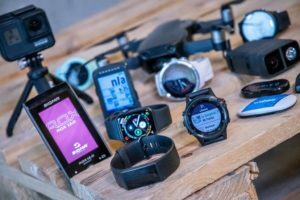 Interestingly, Garmin had the capability on older devices to select your gear and kept track of the mileage of that gear. Was that removed to encourage bike manufacturers to develop 3rd party integration to encourage users to share data with that brand? I’m surprised no one has made a connect IQ app that would have this same functionality. Hmm, I don’t remember that. 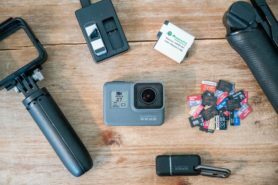 Which device could you choose gear on? Ahh yeah, that was on a per bike basis. Technically, the functionality is kinda still there. These days it’s tracked by a given sensor. Of course, if you lack a sensor – then that’s no good. Unfortunately, none of this translates to Garmin Connect. Which I agree with others – is a missed opportunity. I’m probably missing some subtly of the thread. Corrections welcome. 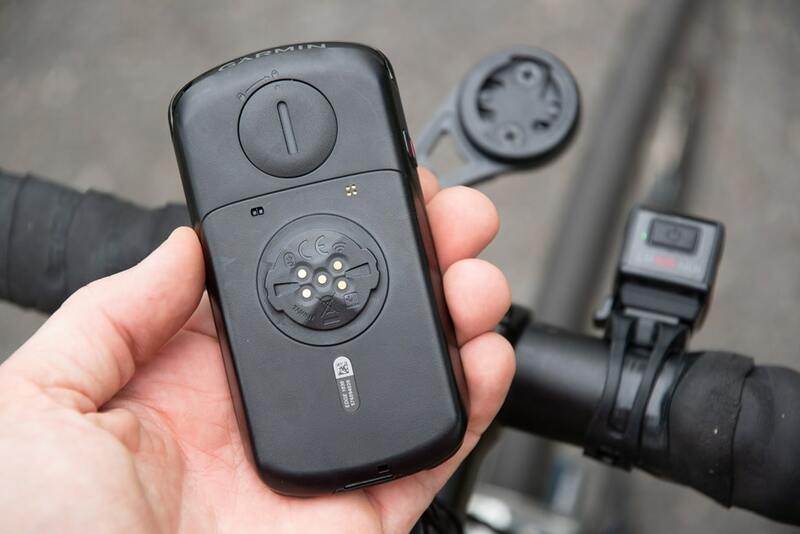 There are various per-head unit odometers, and there is also Garmin Connect-based Gear tracking that allows users to track the number of miles used on a per-bike basis. Each GC activity type can have multiple items of gear associated with by default, and each specific activity can have the bike, shoes, or whatever manually selected in GC as well. With a little warping of the existing GC goal tracking logic user-specified alerts could be triggered at mileage levels. Their zumo motorcycle GPS units have allowed manual track of various maintenance items for years, but as far as I’m aware all that data stays on the zumo unit itself. I haven’t explored it deeply since my maintenance tracking workflow is to capture paper receipts in a binder. 800 and 810 alllowed you to choose your bike and kept a running total for each bike. 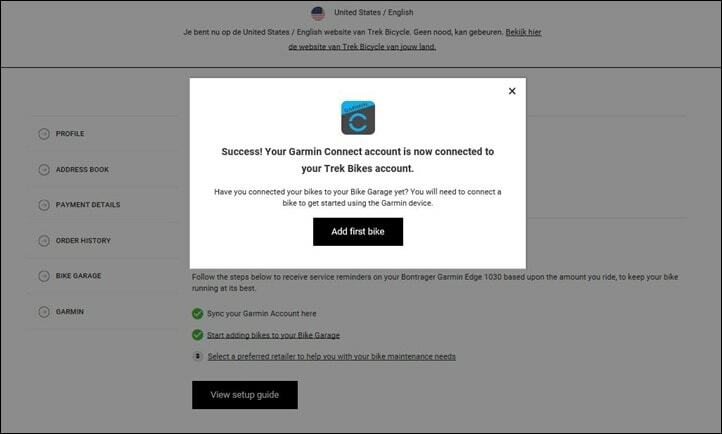 The problem was that data was not uploaded to Garmin connect and therefore you still had to select your bike in Garmin connect. My Garmin Forerunner is on Version 8.7 but there is a Garmin Forerunner 935 asia pacific model and its still on Version 8.0, thats like 3 or more versions behind with no update on the horizon. Theres no way I would risk that with Garmin. This is actually nothing new for Garmin. For years Garmin has been making BMW motorcycle GPS’s as well as Buell and serveral other manufacturerer customized GPS’s based on one of their current garmin models. 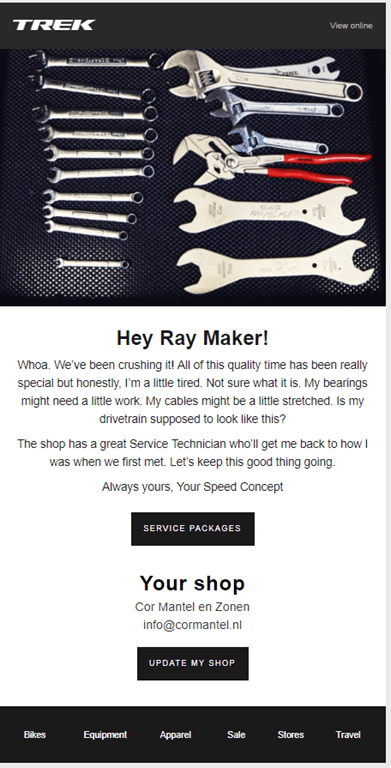 It makes sense they would do this for bicycle companies as well. 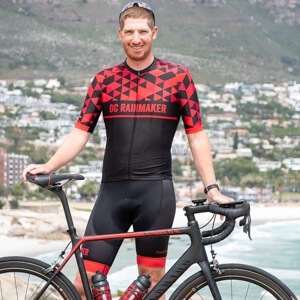 You could argue that Strava could do the same thing for the bike manufacturers, as they allow you to put in your bikes and track mileage against each of them on a ride-by-ride basis. Good question…. Does it have the halo effect like the original 1030? Or is it already the updated manufacturing batch (display/glue) without any halo? Thanks for another ace review of a product I wish had come out 12 months ago and saved me from ditching my (not so completely) trusty Edge 810, snapping up a bargain 1000 then getting a 820. I have ‘only’ x3 bikes inc x2 Treks one of which is fab and the second of which is going to become my winter bike having just had a £215 maintenance bill on the good one …so my points/queries are; I liked having each bike set up on the 810 and I’m pleased this is back, maintenance reminders seem like a smart move (especially as my local bike shop struggles to sell new bikes and is becoming more reliant on recurring revenues that fixing stuff gives), integration with lights is cool and I do it already but I totally agree that a BUNDLE would be persuasive in getting even me to UPGRADE AGAIN – $64k questions: What chances the Bontragerization is going to happen to the 820 and/ or 520 anytime soon, please, new bundles PLEASE, can the excellent Blendr mounts be made big enough to accommodate Garmin WITH a silicone cover too pretty please? (Silly maybe but this last point was part behind me ditching the 1000). Ray, thanks again and rock on! Is the light control app any different to the one on my white edge 1030? Other than mine is a data field and this one is a widget? Unfortunately the Bontrager units are only sold by Bontrager themselves and via their Trek stores/sites. Appreciate the thoughts though! Nope. Aside from the Bontrager Connect IQ apps that you can easily delete/disable, you honestly never have to even know it’s a Bontrager device (oh, plus the startup splash screen and logo on the exterior). Hello Rainmaker, love your in-depth and thorough reviews…the best! My question is that since the Garmin Edge 1030 has been out since at least Summer 2017, will a new model be coming out soon!. This happened to me as I purchased the Fenix 5X, only to have the 5X Plus come out shortly after. I understand that we could wait perpetually for the next best, but since I will be buying the Edge 10XX mostly for a cross-country ride starting in May 2019, should I wait? 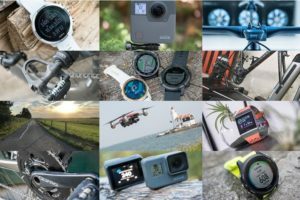 What is Garmin’s typical product life cycle? Have you replaced your own 1030 with the bontrager? 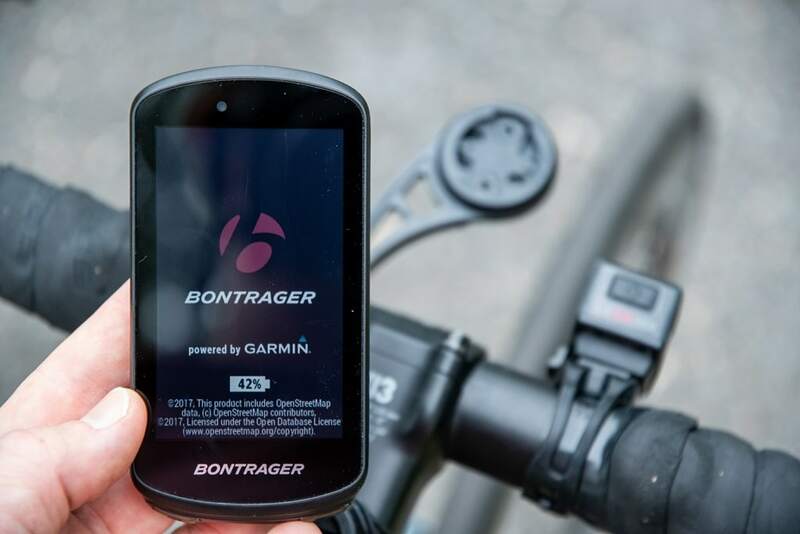 I’m about to buy this one or the garmin, the bontrager is always €599, the “standard” 1030 can be bought for €519, as even warranty can be extend to 5 years for €10. I could place a silicon case to make it black, remains the question, is the functionality for a non trek bike worth the investment.? Thanks for the test. Have ordered. Looked under various sub-menus. Where is this setting?